(Nanowerk Spotlight) Graphene has the potential to revolutionize many fields, especially in electronics to replace the currently used silicon materials. However, graphene does have an Achilles heel: pristine graphene is semi-metallic and lacks the necessary band gap to serve as a transistor. At present, a big challenge for graphene science is how to open a considerable band gap for graphene without significantly degrading its carrier mobility. In previous Nanowerk Spotlights we reported on this issues, for instance on how to employ weak interactions to engineer band structures in graphene. This work was the first attempt to use weak interactions to tune the band gaps of graphene. However, there was an unsolved problem – though many approaches have been proposed, and some have been realized experimentally, tuning the band structures of graphene typically destroys the desired high carrier mobility of pristine graphene. 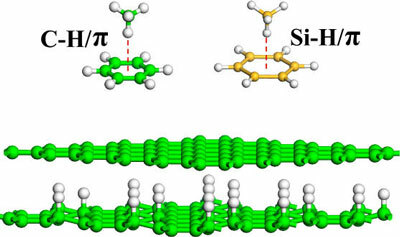 New theoretical results, reported in a recent issue of The Journal of Physical Chemistry Letters ("XH/π (X = C, Si) Interactions in Graphene and Silicene: Weak in Strength, Strong in Tuning Band Structures"), suggest a rather practical solution for gap opening of graphene and silicene while preserving the desired high carrier mobility, which would allow them to serve as field effect transistors and other nanodevices. "By means of dispersion corrected density functional theory computations, we demonstrated that there exist notable CH/π interactions between graphene and its fully (graphane) or patterned partially (C4H) hydrogenated derivatives," Zhongfang Chen, an Associate Professor in the Department of Chemistry at the University of Puerto Rico, tells Nanowerk. "Due to the equivalence breaking of two sublattices of graphene, a 90 meV band gap is opened in graphene/C4H bilayer. The band gap can be further increased to 270 meV by sandwiching graphene between two C4H layers." He points out that via the similar SiH/π interactions, a 120 meV band gap also can be opened for two dimensional silicene. CH/π interaction – a weak hydrogen-bond occurring between soft acids and soft bases – is a subject of intensive researches of chemistry community; however, CH/π interactions in graphene have never been addressed, and no attempt has been made to use such kind of weak interaction to tune the electronic properties of graphene or related materials. This theoretical study is not only the first attempt to extend CH/π interactions into periodic solid materials, but also provides a practical approach for gap opening of graphene and silicene while well preserving their high carrier mobility, which would pave the way for their applications in nanoelectronics. Recently, the weak interactions in graphene-related materials just began to catch attention of the nanoelectronics research community. Chen says that he hopes that his team's studies will inspire more theoretical and experimental studies on using weak interactions to tune electronic properties of graphene-related materials. "In view of the remarkable experimental progress on controlled synthesis of graphene-related materials, we are rather optimistic that our theoretical proposal can be realized by experimental peers soon," he says. "The development of this research filed also relies on more accurate methods on describing the van der Waals interactions."